The Global Property Guide provides figures for effective income taxes, payable on gross rental earnings from residential property for nearly every country. These figures are normally based on calculations supplied by leading accountants. The 'effective' rate is very different from the (usually higher) 'headline' rate. The 'headline rate' merely reports a series of tax bands. The 'effective rate' is an 'after deductions' figure, and is the tax actually payable on your gross earnings, expressed as a per cent of earnings. See notes after the table for fuller explanation. 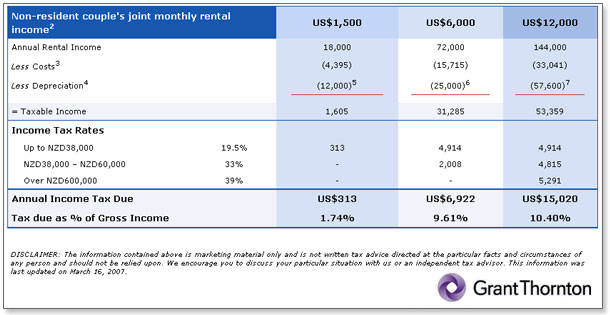 We compute the 'effective rate' of tax on rental income at key bands (E/US$1,5000/month, E/US$6,000/month, or E/US$12,000/month). When we make cross-continent comparisons of tax burdens, we always assume gross rental earnings of E/US$1,500/month. Deduct any other typical costs which a landlord pays, management charges, buildings insurance, realtor agency fees, etc. Either choose a standard percentage deduction (if available) or typical 'actually incurred' costs. If real estate tax is normally payable by the landlord, we deduct that. 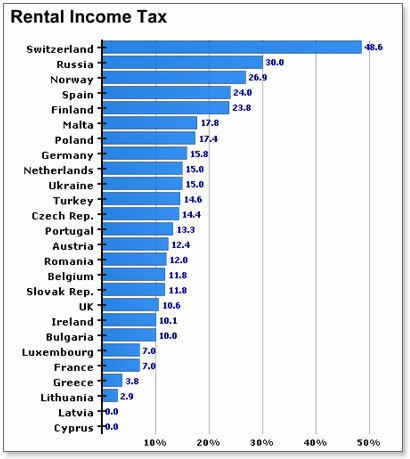 The 'effective' income tax rates shown are in almost all instances different from the 'headline' rates. These effective rates represent what taxes are really payable, after all allowances and deductions. We believe it is more useful, easier, and more realistic to show effective rental income tax rates, instead of concentrating on headline rates. Holding rented residential property through a company can, in some countries, reduce tax, or be the only legal way for foreigners to hold residential property. If so, we provide the relevant tax information.